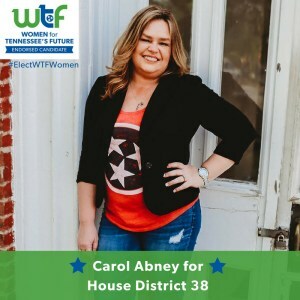 Carol Abney is running for House District 38, which includes Clay, Fentress, Macon, Pickett and Scott counties. Carol is a CPA, small business owner and lifelong resident of Clay County who didn’t have the resources to attend college after High School. At the age of 38, she enrolled in community college and ultimately earned her Bachelor of Science and Master’s in Business Administration from Tennessee Tech. She is active in her community serving on numerous Boards and currently serves as Vice-Chairwoman of the Workforce and Economic Development Committee of Clay County. She is running on a platform of growing our economy with better paying jobs, investing in public education and expanding health care access. Her General Election Day is November 6, 2018.